Send Red basket Arrangement to Chennai. Gifts to Chennai. Send Flowers to Chennai. 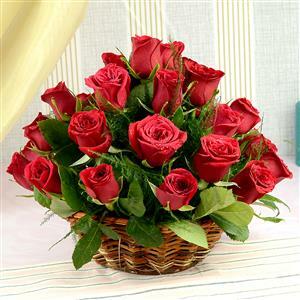 Description : A stunning and extravagant compact posy arrangement of 30 Red roses in a round basket. Send this exquisite flower arrangement to Chennai to express your inner feelings to those who are staying far away from you. The red roses arrangement are beautifully presented in a basket, which would be an ideal gift on any occasion such as Birthday, Anniversary, Marriage and many more. Shop and send Gifts to Chennai through Gift2Chennai.com and convey your emotions and heartfelt feelings in the most righteous way. P.S. Picture is Indicative. Actual arrangement might Vary.